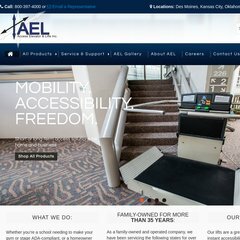 Topics: Manufacturers, Ada Compliance, Residential Elevators, Stair Lifts, Portable Lifts, and Dumbwaiters. Accesselevatorinc.com's IP address is 74.220.215.236. American Registry For Internet Numbers (Virginia, Chantilly) is the location of the Apache server. There are 2 Nameservers, ns1.hostmonster.com, and ns2.hostmonster.com.